Is your puppy or teenage dog wearing you out? We can help. Puppies require a lot of attention. It can be overwhelming to deal with potty training, jumping up, and mouthing. You’re also trying to teach your puppy to stop chewing everyone’s shoes, come when called, and quit dragging you down the street. And don’t forget to find time to exercise your energetic pup and to socialize to new people, dogs and experiences. Teenage dogs can melt your heart one moment and drive you crazy in the next moment by jumping on everyone, pulling you on walks, and dashing out every time someone opens the door. Your busy schedule means some days you just don’t have the time to train better manners and make sure your dog is getting enough physical and mental exercise. Day School is the solution for busy puppy parents. Our innovative drop-off programs provide immersive, customized training and socialization experiences for puppies. Puppy Day School is for pups up to six months old and up to 45 pounds (toy breed pups up to one year old). Each school day includes play time, manners training, potty training/crate training, and socialization experiences to build confidence. Before school starts, we come to your home to meet you and your pup. Our one hour in-home consultation will make your life easier from day one. During the school session, you get regular reports and video highlights, and written handouts. Puppy Day School students also receive a copy of The Puppy Primer book by Patricia McConnell, PhD. Our puppy parent-teacher conference provides in-person coaching to ensure that training transfers to you at home. The Puppy Primer book by Patricia McConnell, PhD. That’s less than $25 an hour for over 40 hours of professional training for your pup! Please review our policies including payment and vaccination requirements. Professional discount available; please contact us for details. Your pup will come home tired, well-behaved and happy! School is held at our training facility at The Knoll, 1030 S. 8th Street, Kalamazoo. Kalamazoo area students in need of pet taxi service can contact Sarah at the Tail Waggin’ at 269.929.8708. South Haven area students can utilize our free shuttle service; please contact us for details. 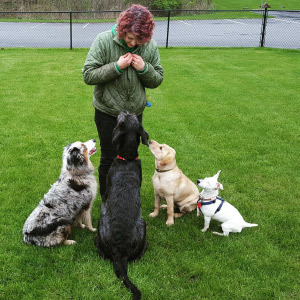 Your pup is taught by professional dog trainers, using only gentle, reward-based methods, to ensure that your pup learns effectively while forming positive associations with training and socialization experiences.